There's not a lot of love for UFC/WWE developer Yukes in the Digital Foundry lair. There has always been a sense that both gameplay and technology in the SmackDown vs. Raw games haven't really progressed since the PS2 era, and for a long while the PS3 entrants in the series have boasted pretty awful visuals. Yukes combine two 640x720 anti-aliasing buffers in an attempt to simulate proper 720p, and the result doesn't work, being both blocky and blurry in equal measure while Xbox 360 owners get the real deal. Hardly the sign of impressive conversion work. So, plenty to prove then with UFC 2009: Undisputed, and the good news is that the technology behind the game is hugely, massively improved over what we've seen from previous Yukes efforts. Similar to Fight Night Round 4, the game is v-locked at 60FPS, with no sign of any drops in frame-rate at all. While the quality of the fighters isn't quite in the same league as EA's efforts, the UFC brawlers still look fantastic, with the close-ups in particular possessing uncanny levels of detail. The differences, as they are, are fairly minute, but notable nonetheless. Xbox 360 benefits from a custom anti-aliasing solution throughout (something similar to Call of Juarez, where two mid-colour pixels are applied to the edges), whereas the PS3 version is somewhat different. There's no anti-aliasing at all in action during gameplay, while the impressive cinematics that top and tail the bouts see the introduction of smooth 4x multisampling anti-aliasing, producing an extremely clean presentation. On both Xbox 360 and PlayStation 3, the cinematics follow a similar formula to that used by Fight Night: Round 4. The frame-rate drops to 30FPS in order to accommodate what are presumably higher-resolution models. There's no difference in performance here - both are rock solid. Over and above that, it's a case of very minor plus and minus points for each platform. 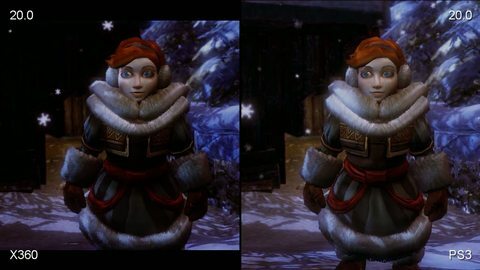 It's obvious that the background and ring decals are of a much lower resolution on the PlayStation 3, but for its part the Xbox 360 version appears to have lower-quality texture filtering. So, overall then, it's effectively a score draw with perhaps a slither-like advantage for 360 with its smoother image and higher-resolution background textures, but the big relief here is that Yukes has seemingly overcome its cross-platform deficiencies on PS3 while at the same time addressing the somewhat ancient elements of its existing SmackDown engine. Fingers crossed we'll see this particular tech deployed in the developers' future WWE games. In a market dominated by shooters, fighting games and sports sims, Codemasters' Overlord was a breath of fresh air: an intriguing action-strategy title that combined innovative concepts with a great script and wonderful artistic direction. Many of the minor gameplay annoyances in the original Xbox 360 release were sorted out with the subsequent Raising Hell edition on PS3, which also added new levels at the expense of a slightly lower performance level up against its pre-existing sibling. Overlord's sequel is a true cross-platform project, with both Xbox 360 and PS3 versions developed and released simultaneously, and similar to the original game there are performance issues with both renditions of Triumph Studios' work. However, crucially, they don't seem quite so important in this particular style of game: smoother movement and crisper responses from the controls would be nice, but the lack of them doesn't get in the way of you having a great time. For the developer, it is clear that the integrity of the image is of more importance than the frame-rate. Bearing in mind the phenomenal amount of work that has gone into the artistic style of the game, the team has opted to engage v-sync and take the hit in frame-rate. However, the result of this is that on both Xbox 360 and PS3 performance essentially switches between 20FPS and 30FPS at any given point, according to load. As you can see on the HD clickthrough above, both can suffer badly, with the PS3 version more prone to locking down to the lower frame-rate with a jerkier update and consequently less responsive controls. Otherwise the differences are slight and once again come down to edge-smoothing. Overlord II on the Xbox 360 appears to be using a custom anti-aliasing solution similar, but not quite as refined as that in Call of Juarez. Just as in the Techland game, the outer edges only are targeted for smoothing, but instead using an MSAA-style smoothing method, a subtle blur is used instead on the edges alone. On the PS3 there is no such evidence of any kind of AA at all. In all, this is a recommended release for both platforms, simply because the sense that you're playing something fresh, new and appealing is still there, despite the fact that it's a sequel. That intrinsic appeal is essentially the same on both versions to the point where the technical differences are an irrelevance.